Slotastic! Online Casino usually divides its slots tournament prize pools up amongst the top ten players but this time they're doing things a little differently. This time, it's winner takes all! The Triple Twister freeroll slots tournament has a $500 prize pool and the top player gets the whole thing! Until February 14th you can even claim a 100% up to $250 casino bonus February 5 to 14 by entering coupon code ‘WINNER250’ as you deposit. 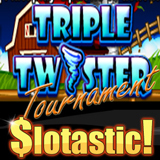 A fast-paced whirlwind of a game, Triple Twister invites players to become a fearsome storm-chaser in search of some great jackpots. It is based around imagery of a raging tornado, with a Weather Vane as the scatter symbol. Three or more Weather Vanes appear from left to right, this unlocks 9 free games (a feature that can be re-triggered). This then triggers a Win-Win feature, ensuring you don’t go away empty-handed.